October is our FINAL SHOW at the Vintage Garage. Vintage clothing, Midcentury modern, vintage furniture, jewelry and so much more this will be our final and biggest show EVER. If you haven't heard the Garage will be under construction above, click on the link above. Join us, let's celebrate 7 awesome seasons. Rosie and the Rivets will play for our final send off! A little extra vinyl is a bonus. Serious music lovers look for the sound that only vinyl can produce. You'll always find vinyl at the Garage every month. In October we offer up an extra heaping pile of it during our Record Ramp. Record players and stereo equipment can also be found. Also hot is vintage Halloween! 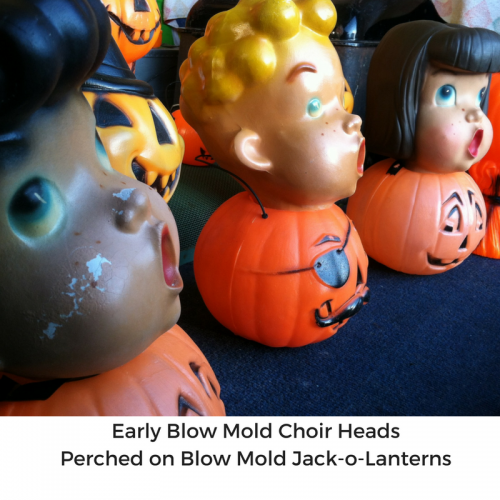 You'll see plenty of cool vintage Halloween blow molds, witches, jack O'lanterns and more. This is always one of our biggest shows of the year. With this being our final show, we expect it to be THE biggest. We hope you'll be there. Vintage appraisals are from 12pm to 4pm! Find out more about appraisals. Got great vintage? Sell with us! Find out how easy it is to sell at Vintage Garage Chicago. Garage vendors bring merchandise from ALL categories, like vintage clothing, midcentury modern, kitchen vintage etc. They save their best vinyl LPs for the June and October show. Dedicated record vendors are also added to our vintage line up. Our resident vintage music dealer Audio Archeology of Uptown entertains us with his DJ skills each month. 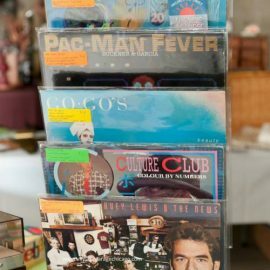 John sets the groove for each market, where you'll find restored and original turn tables, consoles, stereos, cassette tapes and 8 Tracks. Records are offered in all categories, rock, classical, folk, punk, funk, 70's, 80's and 90's. Expect rock classics like the Rolling Stones, The Who and Led Zeppelin. 1970's and 1980's rock is especially hot on vinyl. The Chicago vinyl scene has plenty of Jazz and soul and Vintage Garage is the right place to hunt for records on independent Chicago labels. You can often find a local treasure or two. We asked our vendors, What dream album would you love to find at the Garage?